The DPAS-0.1-20 is a low-noise, low-impedance (50 W), broadband pre-amplifier designed to cover the frequency range of 0.1 to 20 MHz. 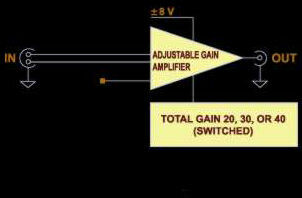 The total gain is switch-selectable to 10, 20, or 30 dB. The input is differential and designed specifically with electromagnetic acoustic transducers (EMATs) in mind. The output is single-ended and will drive 1 V peak-to-peak (Vpp) into 50 W. ± 8 V power is normally supplied from a RAM system. However, the unit will work with ± 5 V supplies.